Physical injuries to teeth, along with decay, can all lead to infections, which if not treated properly, can lead to tooth loss. Once the vital pulp of the tooth has been compromised, it can be hard to keep that tooth without proper endodontic intervention. What are the Risks of a Cracked Tooth? A cracked tooth may not hurt you, initially. Some patients can go for months, or even a year, before they begin to notice any signs or symptoms of further problems. Rest assured, however, that once a tooth has cracked, it’s usually not very long before bacteria begin to infect the tooth’s vulnerable soft tissue. Severe pain, and not just isolated to the tooth itself. You can experience pain in the jaw, neck, and head, as an infection can radiate pain outward. Inflammation, including swelling of the lymph nodes, the tissue in the jaw, and stiffness in the neck. Flu-like symptoms, such as fatigue, soreness of the throat, and difficulty with swallowing food and drink. As a specialist in endodontic care, Dr. Bodepudi’s services could help to immediately address the severe pain that a cracked tooth, and resulting infection, could bring. Every crack in a tooth is just as different as every tooth, and every patient; different cracks are caused by different types of damage, by decay, or by teeth which may be crowding each other. The following is a list of different types of cracked teeth. Craze lines are cracks that occur on the outer enamel. They are usually surface-level cracks that won’t put the actual tooth at risk. While you may want to have these types of cracks repaired because they can effect how the tooth looks, they aren’t at a high risk for further damage or infection. Fractured cusps occur when a piece of the crown, or the “chewing surface,” of the tooth has broken off. While they don’t always cause immediate pain and discomfort, they can most certainly lead to infection, because they expose some of the vital parts of the tooth to food and bacteria. A filling or a crown may be placed in these situations, depending on the extent of the break. Cracked teeth specifically refer to cracks that run from the outer layer of your tooth down toward its root. Cracked teeth don’t always split or break up right away, but they can mean extraction may be necessary if the crack isn’t diagnosed before it reaches the root under the gum line. These types of breaks can be very painful for patients, but if they’re caught early enough, the tooth can be saved. You should never wait if you have a cracked tooth– the chances of an infection greatly increase over time. Split teeth are what happens when the crack has reached below the gumline. 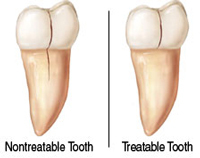 The tooth itself can be separated. It may be possible to save a portion of the tooth, but in a majority of cases, extraction may be necessary. Note that if you do have a tooth extracted because it is split, you may have the option of a dental implant moving forward. Vertical root fractures start at the root and move upward, and are not very common. They can be more difficult for a patient to notice because they may not initially be painful, but the damage to the root inevitably means that the surrounding tissue will become infected and inflamed. Endodontic procedures can be performed to remove the fractured part of the root in some cases, so the tooth itself may not need to be extracted. Again, waiting to have this procedure performed could mean increasing your chances of a painful oral infection. In all cases, the sooner that you catch the crack through a diagnosis, the better your chances will be of saving a tooth from needing to be extracted, or from having a serious oral infection that could cause pain and threaten your health.